My family and I visited Disneyland and Disney California Adventure for the first time in April, 2017. I thought I had done my research beforehand, but there were still many things we learned on the trip. This post contains insights and tips that I wished we had known ahead of time. 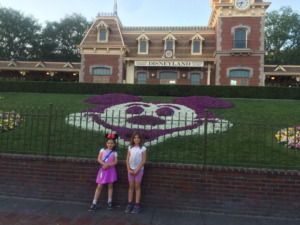 Should I stay at a Disneyland Resort Hotel? 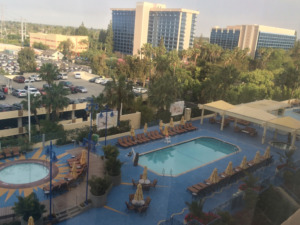 There are three hotels on the Resort: Disneyland Hotel, which is right across from the security screening to Downtown Disney; Paradise Pier Hotel, which is the furthest away, but some rooms have views of the World of Color nighttime spectacular; and Disney’s Grand Californian Hotel and Spa, which is the largest and has an entrance to Downtown Disney. The pools at Paradise Pier Hotel (there’s also a waterslide). That’s Disneyland Hotel in the background. The main benefit of staying in a Disneyland Resort Hotel is that you get to enter one of the parks an hour before general admission for one morning during your stay. 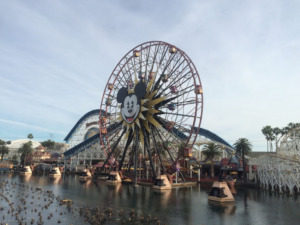 What we didn’t know is that each hotel is assigned a theme park for the morning magic hour, so for example, on Saturday morning, guests staying at Paradise Pier can enter Disneyland an hour early, and guests staying at the Grand Californian Hotel can enter Disney California Adventure an hour early. On Sunday, it will be the reverse. The Disneyland Magic hour is from 7-8AM and you can take the monorail from Downtown Disney to Tomorrowland (just make sure you have your hotel key with you as you need to show it to get on the monorail). The Disney California Adventure Magic hour is from 8-9AM. While the extra hour does make a difference, realistically, you can still only get on about 2-3 rides and not all rides are open in that hour. We stayed at Paradise Pier and liked the convenience of not having to drive to the parks every morning. Hotel guests receive coupons for a free lanyard and pin, a 5×7 photo, a discount on the ESPN game zone, and 10% off dining in Downtown Disney. My girls liked taking a break from the parks to go swimming at the hotel in the afternoon. 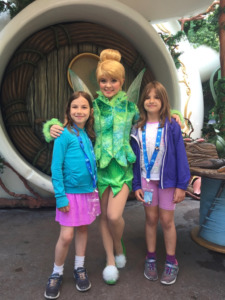 Hannah and Amy met Mickey, Minnie and Stitch when we first arrived. All hotels offer character dining, usually for breakfast. The hotel food was so-so, but again, convenient. The famous Mickey ears were incorporated into everything throughout the hotel. 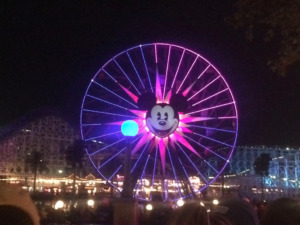 How many days do you need to visit Disneyland and Disney California Adventure? I would say 4 days is ideal; 2 days in each park. 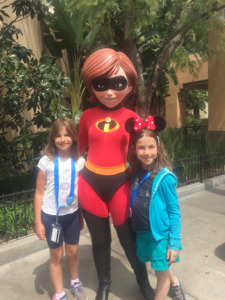 We had 2 1/2 days there and spent a day and a half at Disney California Adventure and a day at Disneyland (including the extra early hour admission). We managed to get on almost all the rides in Disney California Adventure, and about half of Disneyland, even with breaks for swimming. Disney California Adventure is a smaller park, with about 31 attractions, no parades, and one nighttime show. Disneyland has about 54 attractions, though some of them are closed for refurbishment. Disneyland also has 2 parades and fireworks. The one day we went to Disneyland, the fireworks were canceled due to high winds. A second day would have given us another chance to see them. Mickey’s Fun Wheel with California Screamin’ in the background. The Fun Wheel is a swinging gondola. Note: There is a separate line to go on a non-swinging gondola. It also depends on what you want to do at Disneyland and how old (and tall) your kids are. If you want to see the shows and meet the characters, you’ll have less time for rides. If your kids are younger or don’t like rollercoasters, then you won’t have to wait as long to get on the rides. Do you want to do it all? Then you’ll definitely need more than 4 days. 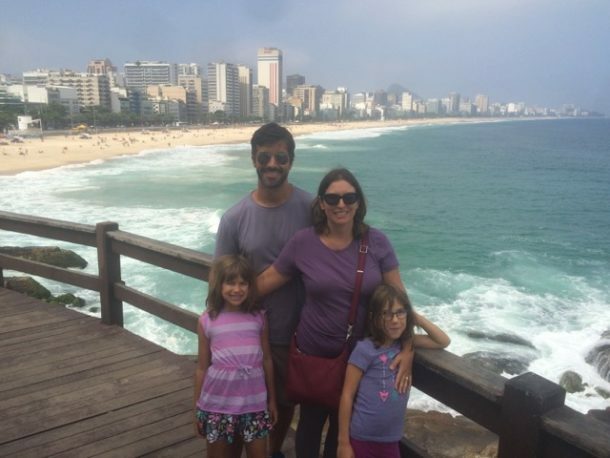 My kids were 7 & 9 and both were above 48″ tall, so they could go on all of the rides. We managed to see the Frozen show, meet some characters, watch the World of Color spectacular at Disney California Adventure, and see the Electrical Parade at Disneyland in 2 1/2 days. Should I get a Park Hopper Pass? A park hopper pass is $50 more than a single park pass. I knew there was a lot of walking involved in the Parks and I thought we would waste too much time if we tried to go between the parks, so opted for single park passes instead. For the most part, this was a good choice as you easily need a full day in each park. The only time I wish we had the Park Hopper is when the fireworks were canceled, as that was our only day in Disneyland. It really depends though on what you want out of your Disney experience. If you just want to go on the most popular rides in each park, a park hopper pass may be better. If you want to see as much of the Parks as you can, I would recommend a single park pass for at least 2 days, and maybe a park hopper pass for a third day. 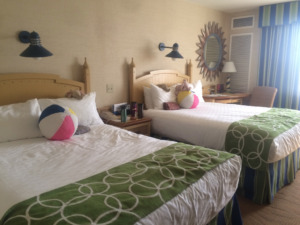 If you stay at Disney’s Paradise Pier hotel, there is about a 5 minute walk to Downtown Disney. You go through security screening, then have about another 15 minute walk through Downtown Disney to the entrance of the theme parks. 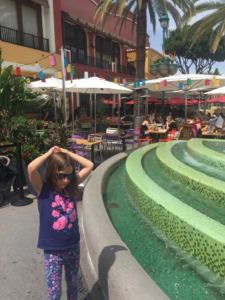 Be prepared though, Downtown Disney is meant to distract your kids with fountains, artists, the Lego store, Disney Store, Build-a-Bear, etc., so definitely plan on it taking longer. Within the theme parks, it can easily take 20-30 minutes to get from the entrance to the back of the park. Prepare for it to take longer if you stay until closing and are trying to get out at the same time as everyone else. Waiting in line at Luigi’s Rollickin’ Roadsters. The attention to detail is amazing, particularly in Cars Land. For the most part, you’re waiting in shade. We went in April (before Easter) so it wasn’t quite peak season. The most popular rides (the ones that offer FastPass) have a wait of 45-120 minutes without a FastPass. For all the other rides, the wait was anywhere from 5-40 minutes. The one exception is Peter Pan’s Flight in Disneyland which doesn’t have a FastPass, and has a wait of 40 minutes or more. Download the Disneyland App, as the wait times for all the rides are listed and are updated in real time. I used this App several times throughout the day and highly recommend it. Even though we typically had ride lines of 30 minutes or less, it was still too long for my 7 year old, so bring something to keep the kids occupied. Note that there are lines everywhere, not just for rides. For example, there are lines for security screening, to get into the Park, for food, for the bathroom, to buy merchandise, to meet a Disney Character, etc. I think one of my longest lines was waiting to buy an ice cream cone because there was only one person working. How does the FastPass work? 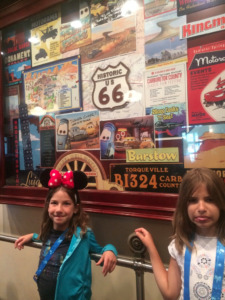 The most popular rides have FastPass kiosks, usually near the ride (except for Radiator Springs Racers – the kiosk is near It’s Tough to be a Bug in “a bug’s land”). You insert your theme park pass in the FastPass machine and it will print off a FastPass ticket. Your FastPass will state a one hour time slot. If you return during that time, you enter the FastPass lane and basically jump the queue. This is our FastPass for Radiator Springs Racers. It shows when to return to the ride, and when we can get another FastPass. As we learned though, you can only hold one FastPass at a time with two exceptions: 1) The World of Color FastPass can be held with another FastPass, because the show is at 9:45PM. 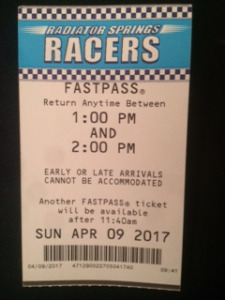 2) If your FastPass time slot is for 3-4 hours later, your FastPass will indicate the time when you’re eligible to get another one. For example, we went to the Radiator Springs FastPass kiosk at 9:30AM, but our FastPass time slot was for 1:00-2:00PM, so we could get another FastPass ticket after 11:40AM. The Disneyland App, as well as the FastPass Kiosks will indicate when the time slots are for, as some may be for an hour later, but others could be for 3 hours later. Only a limited number of FastPasses are issued and some rides do run out, so my recommendation is to go for the most popular first, even if the time slot is later. Radiator Springs Racers, Toy Story Midway Mania and Soarin’ Around the World are the most popular rides in Disney California Adventure. Hyperspace Mountain, Star Tours – The Adventure Continues, Indiana Jones Adventure, Splash Mountain, and Big Thunder Mountain Railroad are the most popular rides in Disneyland. What are the food and souvenir prices like? Should I see the Parades and Fireworks at Disneyland? The main thing to know about the parades is that people start lining the parade route 2 hours in advance. 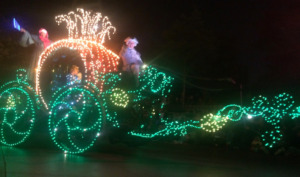 We didn’t see the Mickey Soundsational Parade, but did see the Main Street Electrical Parade. The parades start at It’s a Small World and end at the Town Square. The viewing areas were at the starting and ending areas as well as near Sleeping Beauty’s Castle. We were able to get a front-row spot at It’s a Small World. People seemed to be lining the end of the route first, likely because it is closer to the exit when the parade is over. The best viewing areas for the fireworks are the same as the viewing areas for the parade. We had FastPasses to World of Color, and definitely recommend the show. The FastPass kiosk is near Ariel’s Grotto and the ticket will indicate a specific viewing section. Even though we were fairly close to the front, my husband and younger daughter still had a somewhat obscured view behind a lamppost. 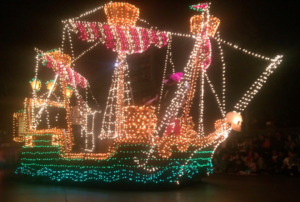 The World of Color and the Electrical Parade were my eldest daughter’s favorite things at Disney. If you are going to stay into the evening, bring warm clothes, as it really does cool down at night. My eldest didn’t want to stay for the fireworks because she was still in her shorts and was freezing. Also, bring drinks and snacks. Disney lets you bring outside food in, so we had lots of snacks to munch on while waiting in line after line, as well as reusable water bottles that we could refill at fountains throughout the park. You can get a hand stamp to re-enter the park, however, you’ll still need to show your Theme Park Pass. Also know that if your child goes swimming, the stamp will likely come off. This is what happened to my daughter – she forgot her pass and her stamp had washed off. We had to show them a picture of her in the park that day for her to be allowed back in. This is the last time Hannah had her water bottle. She must have left it on the ride. 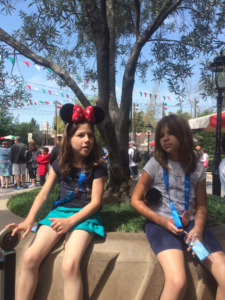 This picture proved that Hannah had been in Disneyland earlier that day. Finally, talk with your children about what to do if you get separated, as that happened to us four times. Despite the lines and the meltdowns, we all had a good time at Disneyland and Disney California Adventure. 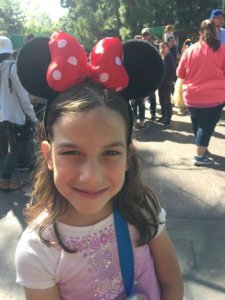 I hope these insights and tips help you have an enjoyable first time at Disney! Thank you! I’m glad you like the post. There is a spot in the side bar where you can sign up to my email list and be notified when new content comes out. I usually publish a new article every Wednesday. I just want to say I’m beginning my blogging and site-building and truly loved your blog site. Probably I’m going to bookmark your blog post . You really come with superb stories. Cheers for sharing with us your webpage.